You're receiving this newsletter because you bought prints from us or contacted us for information. What happened to Issue 11? The Aussie Hind build has stalled horribly! That's what I get for moving house. Work will resume shortly, for the sake of my own sanity if nothing else. You can see progress on the build log on the Grubby Fingers website when it happens. Grubby Fingers A3+ prints are only AUD$29.95 ea. (inc GST, + P&H). PayPal and major credit cards (through a secure PayPal portal) are supported. Does Grubby Fingers do commissions? Yes, we do. 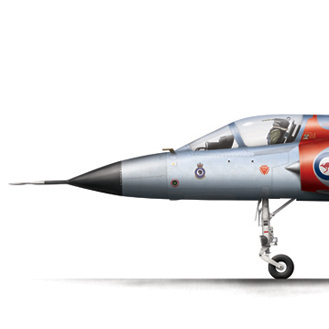 If you are looking for that special gift or memento, we can produce a print of any aircraft or vehicle in any colour scheme at very reasonable rates, starting at just $100 including your first print. We also do corporate and publishing work if you are looking for an eye-catching promotional image, have a book in the pipeline or publish a magazine. All profiles are available in various colour schemes and variations, and sizes and custom orders are not a problem. And from the Grubby Fingers on-line shop. 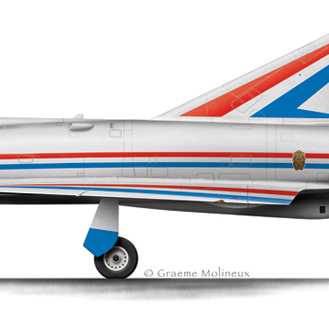 For more information about Grubby Fingers Aircraft Illustration visit the website. Any comments and suggestions are always welcome. Let us know what you´d like to see in the newsletter or as a print by dropping us a line through our contact page. To unsubscribe, reply to the delivery email and change the subject to UNSUBSCRIBE. A3-100 in bare metal finish. 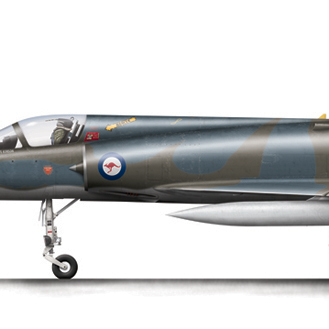 Dassault's Mirage is one of the most beautiful aircraft ever operated by any airforce, let alone the RAAF. It's been on the Grubby Fingers Wanted List from day one and it has finally arrived. The first subjects are, in fact, just one subject. The first four releases trace the operational career of one particular airframe from day one to retirement. A3-15 has been drawn in four of the colour schemes it wore over its service life in the RAAF. Each scheme represents a separate era in the life of the jet. Above you can see the early bare metal scheme. She was dressed in fatigues for a few years before being paraded around in a red, white and blue scheme for the RAAF Diamond Jubilee displays. 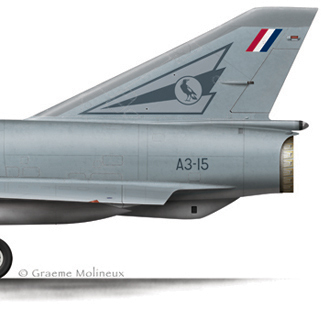 From the Jubilee scheme until retirement, A3-15 wore a contemporary Air Defence grey scheme. After she left RAAF service, A3-15 went on to serve with the Pakistani Air Force. I am waiting for photos from Pakistan at the moment and, when they get here, I will offer that scheme too. I went a bit crazy with the camera in the last couple of months, and you get the benefit. 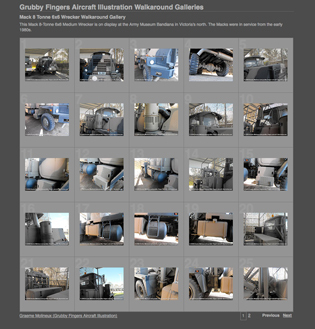 We've worked out a new way to present the walkaround galleries. I'm sure you'll agree it is an improvement on the old style. It is much easier on the eye and easier and faster to use. Regular readers and subscribers might be wondering what happened to the November issue of The Grubby Truth. Well, I'm not telling. The price of a standard Grubby Fingers A3+ print is now $29.95 AUD inc GST. Visit The Grubby Fingers Shop for the full print range.